In a world where so many different types of Blythes exist, none of them hold a candle to the vintage Kenner Blythes. From the Ashton-Drake Galleries reproductions, to Takara’s BL, EBL, SBL, RBL, FBL, & RBL+, to Middies and Petites (Takara & Littlest Pet Shops), and the notorious fakes/counterfeits – none of them even begin to compare to the vintage 1972 dolls created by Kenner. These dolls were before their time, competed poorly against Barbie, and disappeared from the shelves without a trace. When I was first getting ready to go to Portland for BlytheCon in 2011, I thought it would be so cool if I got to see a BL in person. Before Portland, the only Blythes I had ever seen in person were my own. Kenners weren’t even really on my radar because they were always something that I considered to be “unattainable”. Maybe it was because of the perceived price tag, or the fact that I just didn’t realize how badly I wanted one until I saw one in person. Once I saw a Kenner Blythe in person, I was hooked. Following BlytheCon Portland, I went back to work and I happened to work a lot of overtime that summer. I decided that I would set aside all of the money I made on overtime towards a Kenner. By the time September rolled around, I had enough for a Kenner. I just needed to find the ‘right one’. Emmalynn popped into my life of October 2011, a few months after Portland. By then I was pretty much head over heels for all things Kenner. Emmalynn is, without a doubt, an imperfect Kenner. But she was (and still is) my imperfect Kenner. There’s something magical about Kenners. 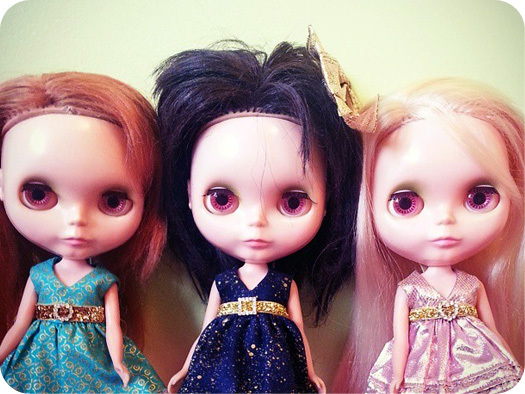 In the feel of the plastic, the smell of their hair, the adorable pip sound they make that is so soft and endearing compared to the louder eye mechanisms of modern Blythe dolls. The beauty in Kenners comes from the fact that even if you were to take two Kenners of the same hair style and put them next to each other – they will always have their own special differences. The magic is surely a byproduct of being a doll that is 43 years old. Kenner fever is surprising. It makes you pay attention to the ebbs and flow of the auctioning world. This was before the days of Facebook groups for buying and selling dolls and sundries. I was on eBay a lot, I paid attention to what prices certain hair colours went for, and which dolls just sat there (note to would-be sellers, if you’re pricing a Kenner Blythe doll that looks ragged for well over $1000 USD, it’s going to sit there for a very, very long time). With a brunette, a blonde, and red-head in my family – I’m pretty content! For now, the feelings of wanting a Kenner has been sated. I know that for some people, these feelings never really go away. Perhaps if I had the funds to put towards a Kenner right now, I would feel differently. I may even get a brunette with more tamable hair, or a wispy-banged raven girl. For now, my three keep my happy and the Kenner fever at bay. Emmalynn’s wearing: dress/chelleshocks (top), dress/Kult of Kulta (bottom). Prim’s wearing: dress/Kult of Kulta, bow/Kult of Kulta. Lily’s wearing: dress/Kult of Kulta. I like Blythe dolls but I don’t know if I would ever buy a Kenner. I guess that for me to consider getting one, it would have to be love at first sight as has happened with all my dolly purchases. 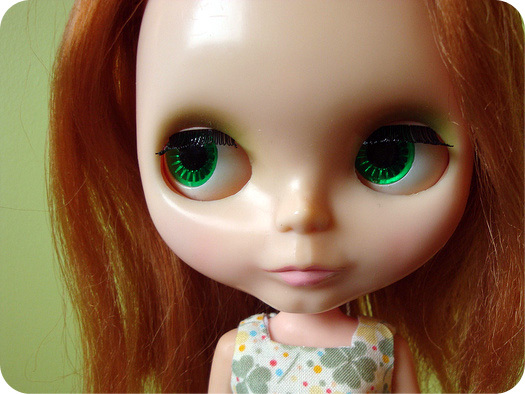 At the moment, I’m just waiting for the perfect Middie Blythe for me. Hey, the heart wants what it wants. Kenners are definitely magical little creatures. So far, however, I’ve managed to avoid Kenner fever. Which is good, because I definitely can’t afford one. ???? I’m going to my first blythe con soon, and I hope to get to hold a kenner and hear the *pip*! The price tag that comes with Kenners make me balk though, and I can’t see myself doing well with restoring a baity one.